Sensei David Shim was born in South Korea in 1961 and in 1968 immigrated to the United States of America. Before he received any formal training in martial arts, he received informal teaching from his Uncle Jay, who himself had trained in the Korean Martial Art of Yudo since childhood. His first exposure to structured training came at the instruction Sensei Joseph C. Hess, a 10th Degree Black Belt in the GoJu-Ryu discipline of Karate. It was with Hess that Sensei Shim received his purple belt. Sensei Hess was a pioneer in the field of contact Karate before safety equipment had been incorporated into sparring in 1975. Sensei Hess was the Full Contact Karate Champion from 1975 to 1977 and has been inducted into the Hall of Fame in the Black Belt magazine. David recalls that when he started training with Sensei Hess, he would tell his mother to pick him up two hours after the class ended. When Sensei Hess asked David where his mother was, he would reply that he did not know. Sensei Hess would allow David to observe (and sometimes participate) in the adult Advanced Karate classes. This is how Sensei Shim learned the Surinja Kata (formal exercise) which is his signature form. Under Sensei Fred Klott, a 5th Degree Black Belt in Okinawan Shorinji Kempo and Okinawan GoJu-Ryu, Sensei Shim received his own Black Belt when he was 17 years old. At the age of 26 he was one of the youngest recipients of a 6Th Degree Black Belt (Rokudan) and has since worked up to the 9th Degree. All these degrees were earned under Sensei Klott. An earnest student of the martial arts, Sensei Shim trained with several other teachers in arts ranging from Japanese sword play (Iaido) to the Okinawan weapons art of Kobudo with the late Sensei Jeff Smith. Sensei Klott had introduced Sensei Shim to his numerous colleagues who taught different styles including Shotokan, Isshin-Ryu, and Shorin-Ryu Karate styles. So complete is Sensei Shim’s mastery of Okinawan GoJu-Ryu, Shorinji Kempo (Okinawan style), and Kobudo that he was named as successor to Grandmaster Klott. Along with this title, Sensei Shim received the “daimyo menkyo”. In essence, this is a blanket certificate, which gives him the responsibility of modifying and modernizing Klott’s teachings and trainings as he sees fit as a means of ensuring its fixture in the 21st century. Currently he holds the rank of 9th degree Black Belt in Karate. Sadly, Sensei Klott passed away in 2007. 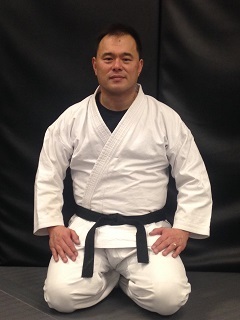 Since 1985 Sensei Shim has been teaching martial arts in the Greater Boston Area. In that time he has established a Karate courses within the Creative Arts at Park (CAAP) Summer Program which continues to run to the present day. He also initiated the popular Karate program at the West Roxbury YMCA (from 1986 to 2013) in addition to being a founder of the Jamaica Plain Martial Arts Academy. The number of students Sensei Shim has trained over the last three decades numbers in the thousands, and of them over twenty have earned their Black Belts. Two former students are now teaching Sensei Shim and Sensei Klott’s style of Karate; one in the state of Georgia and another in Southern Australia. At the tender age of 47 Sensei Shim discovered his newest passion: Brazilian Jiu-Jitsu. Training mainly under Professor Roberto Maia at the Boston Brazilian Jiu-Jitsu Academy, Sensei Shim has also learned alongside Black Belts Phil Meyers, Chris Page, Al Bibeau, and Chris Owen. Professor Maia is cousin to Professor Carlos Gracie Jr. and Renzo Gracie whose family developed the art of Gracie Jiu-Jitsu. Professor Maia is responsible for bringing Brazilian Jiu-Jitsu into this are back in 1995 when few people had heard of this style of martial art. As of January 2014 Sensei Shim has himself earned the rank of Black Belt in Brazilian Jiu-Jitsu, and since well before that, he has worked to incorporate that style of training into his overall martial arts curriculum. What is now known as Mixed Martial Arts is a newer integrated form of fighting which incorporates Brazilian Jiu-Jitsu, Muay Thai (Thai Boxing), Boxing, and Wrestling into an impressive style of fighting which can be observed in the UFC and other similar forms of entertainment fighting. Sensei Shim has always believed that the best form of martial art has to be an integrated form that incorporates both stand-up and ground fighting techniques. Sensei Shim is forever indebted to his BJJ instructors for teaching him the art but also for helping move his Karate to a better, personal level. Sensei Shim is of the philosophical belief that martial arts is not static, but an entity that is actively changing and developing all the time. It is his belief that one must change as the art develops, and his passion lies in “passing on the WAY….straight and well”. This quote is attributed to Gichin Funakoshi Sensei, the founder of Shotokan Karate and the pioneer Master who brought Karate from Okinawa to Japan and subsequently to the rest of the world. However, Sensei Shim adds “who will take to the WAY straight and well”? In addition to being a high-ranked martial artist, Dr. David Shim is also a clinical psychologist by training and a full-time faculty member in the Department of Psychological and Brain Science at Boston University. He received both his B.A. in Psychology and Ph.D. in Clinical Psychology from Boston University and his M.A. from Boston College in Counseling Psychology. His dissertation involved studying the psychological effects that self-defense training has on women who have been assaulted in one manner or another. Dr. Shim has held adjunct positions at Suffolk University, Emerson College, and the University of Massachusetts, Boston and has practiced psychotherapy in the Greater Boston area since early 1987. Dr. Shim will forever consider himself a student of martial arts and is passionate about teaching others to defend themselves and to improve one’s character through physical training. Whether it is Karate or Brazilian Jiu-Jitsu or whatever martial art thatone enjoys, we breakdown the psychological limitations that holds us back because we face our fears every time we train. When we challenge those barriers, what comes out the other side is usually a more improved and altered version of ourselves. In many ways, this means that the martial arts academy has to be a friendly, welcoming place where we challenge ourselves and each other to grow every time we train. Otherwise, it can become a potentially dangerous place both psychologically and physically. It is Dr. Shim’s desire to bring martial arts to whatever community he serves in a competent and holistic way. But most importantly, to have fun and enjoy what one is learning!! Osu!